This entry was posted on Wednesday, July 23rd, 2014 at 8:00 am	and is filed under Homeschooling. You can follow any responses to this entry through the RSS 2.0 feed. You can skip to the end and leave a response. Pinging is currently not allowed. Great points! You are assuring me that I’ve made the right decision to do science and history with all of my kids together 🙂 Thanks! 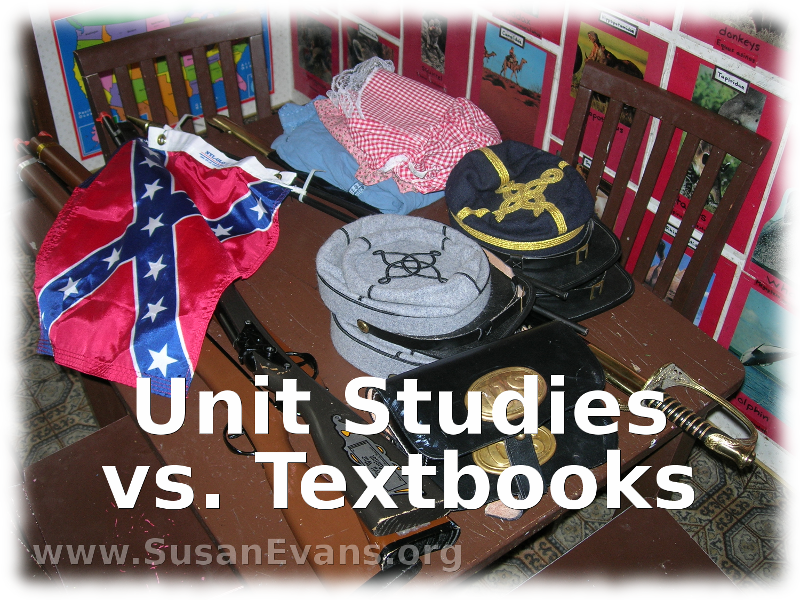 Science and history are wonderful subjects for unit studies. When all your kids learn together, you have more unity as a family! I would love to be a teacher of history. It is something I can dream of as I will never become a teacher. Anyone can be a teacher if they decide they want to homeschool their kids. The parents know their kids best and can provide individualized instruction. Thanks! Lots of people are scared to let go of textbooks because they think textbooks contain more information, but when you realize textbooks are written in a superficial manner compared to unit studies, it helps people to see textbooks in their proper perspective. I might be missing the point here, but I fail to see how teaching a 6th grade level student the same information as you are teaching a 3rd grade student makes it more memorable for both kids? I don’t think either child is learning at their own capacity when you put both of them in a room together and teach them in the same fashion. The 6th grader should be able to comprehend the material better. Not so with the younger child. If you have a 6th grader and a 3rd grader, you can teach to the level of the 6th grader, explaining extra to the 3rd grader if needed. Most books can be understood by all elementary students, and they can do reading and writing assignments on their own levels. Right now I’m reading Uncle Tom’s Cabin to my kids who are 14, 12, 11, and 9. I occasionally define a word for my 9-year-old, but our deep philosophical discussions about slavery and equality cause quite a stir at the dinner table. My children talk with each other about real issues. I think unit srudies are a great way to go! So do I. That’s why I do unit studies with my kids. They learn so much while having fun!